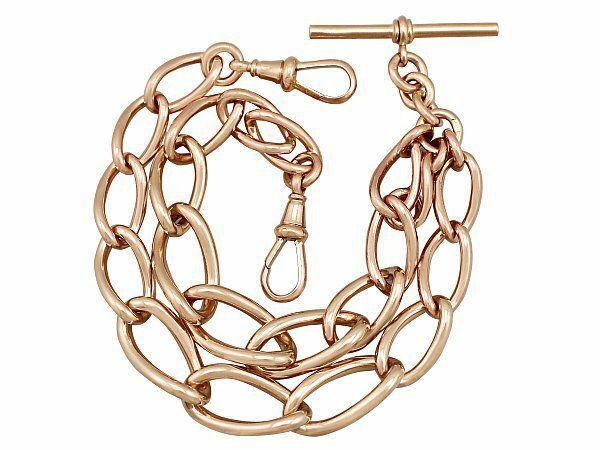 This exceptional, fine and impressive Antique watch chain has been crafted in 9ct rose gold. The double Albert watch chain is composed of graduated oval curb links, each individually hallmarked with the 9ct gold fineness mark (9.375). The chain is fitted to either end with the original swivel clasps, each struck with the 9ct gold fineness marks (9.375) and maker's mark 'B&S'. The T-bar suspends from the centre of the chain, also struck with the 9ct gold fineness marks, the Birmingham Assay Office hallmark (anchor) and maker's mark. 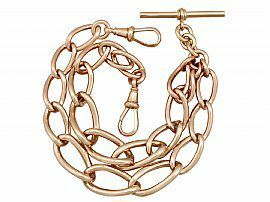 One oval curb link articulates from the ring loop to the centre of the chain, which is truck with the Birmingham Assay Office hallmark and the date letter for 1917 (S). This exceptional double Albert watch chain is exceptional quality composed of large and impressive solid links, each individually hallmarked. The rare double Albert watch chain is an exceptional gauge of gold and is in excellent condition, the hallmarks deeply struck and clear.